“When I called MEM, I was told that although the codes had been in effect since 1997, no one had reported the error before,” said Dr. Chelimsky. “Don't assume that anyone is aware of the particular problem you are having with reimbursement, even if it is related to a national policy,” he said. ''Moreover, don't assume that we have such a cumbersome system that nothing can be done about it. Furthermore, as private carriers adopt CMS policies, the cumulative financial consequences may have a major impact on a practice's bottom line. P. David Charles, MD, Director of the Movement Disorders Clinic at Vanderbilt University Medical Center in Nashville, TN, encountered a more difficult problem. There was a consensus among providers that reimbursement for deep brain stimulation (DBS) programming was undervalued. “It was lumped into a category defined as any neurostimulator, which did not adequately characterize the procedure,” he explained. MEM was contacted to investigate the matter and after accumulating detailed data on how much time it took to perform the programming and how complex it was in comparison to other types of work, the subcommittee applied to the American Medical Association (AMA) Current Procedural Terminology (CPT) Editorial Panel to create new codes. “Although the codes were approved, we are now waiting to hear if CMS takes the recommendation from AMA's Relative Value Update Committee (RUC),” explained Dr. Charles. RUC advises on physician reimbursement values and the Practice Expense Advisory Committee (PEAC) advises CMS on standards for practice expenses. Charles H. Tegeler, MD, Professor of Neurology at Wake Forest University School of Medicine in Winston-Salem, NC, and Past-Chair of the AAN Neuroimaging Section, agrees. “Often, there is a viable recourse, so it is wise to seek action.” When AAN members began to express frustration that they were performing specialized Transcranial Doppler studies but were unable to get paid, Dr. Tegeler worked with MEM to develop the proposals for new codes and present them to PEAC and RUC. “Establishing a new CPT code is a several step process,” explained Dr. Nuwer, Past Chair of MEM. ''First, because it takes an estimated one million dollars to create and implement a new code, we need to weigh its value versus cost; there needs to be enough of the service, such as, for example, 10,000 procedures per year nationally. Dr. Nuwer noted that there were plenty of DBS procedures performed annually, for example, but the question was whether the existing code adequately described the service. ''We argued that it did not, because it lumped DBS programming together with programming for spinal and peripheral stimulators – and the latter was substantially less work. After more than 60 users completed time and expense surveys, we reviewed the proposal with other societies and key contact people. At times, members report reimbursement problems that require innovative strategies. For many years, there was a major ambiguity in the nerve conduction study code definitions – how to code for studies of two or more branches of a given motor or sensory nerve. MEM members, working in collaboration with the American Association of Electrodiagnostic Medicine, and with the approval of the AMA and HCFA, solved this problem. 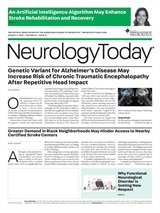 The AAN also gets involved when neurologists are denied reimbursement due to diagnostic coding problems. John Hart, Jr., MD, Associate Director for Clinical Activities at the Geriatric Research Education and Clinical Center of the Central Arkansas Veterans Healthcare System in North Little Rock, AR, and President-Elect of the AAN Behavioral Neurology Section, said: ''It became evident several years ago that the codes to describe dementia had not kept up with the level of knowledge and expertise that had evolved over the years and failed to accommodate the subtypes that had been identified, such as frontotemporal dementia and dementia with Lewy bodies. Consequently, neurologists were being forced to replace these entities with less specific codes. “The consequences of failing to provide the federal government and other agencies with condition-specific codes can be that resources are not allocated to study these diseases or to provide researchers with funds or to help affected patients with treatments and other essential services,” Dr. Hart said. He consulted with MEM Chair Dr. Powers, who has advocated for new diagnostic codes and clarifications and improvements to the current codes for the past 12 years. The AAN Web page, www.aan.com/professionals/coding/coding.cfm, provides a wide range of coding tools for neurologists. The annual ICD-9 (diagnostic) coding changes are available at www.aan.com/professionals/coding/2005_coding.pdf. The AAN Medical Economics and Management Subcommittee updates the ICD-9-CM and CPT for Neurologists annually.